The Evangelical Church of Augustan Confession in Romania (German: Evangelische Kirche A.B. [Augsburgischen Bekenntnisses] in Rumänien) is a German-speaking Lutheran church in Romania, mainly based in Transylvania. 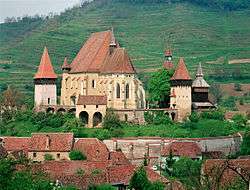 Its history goes back to the 12th century when the Transylvanian Saxons arrived in the region, then part of Kingdom of Hungary. The church has particularly close ties to the Evangelical Lutheran Church of Romania, which is mainly Hungarian-speaking, and also cooperates with the much larger Calvinist Reformed Church in Romania.